Chinese Progressive Association | Join us for 2018 CPA’s Youth Movement of Justice and Organizing Program! Join us for 2018 CPA’s Youth Movement of Justice and Organizing Program! Summer program begins June 13th-16th with our retreat, then picks up with regular programming June 25, 2018, and ends on August 14, 2018. 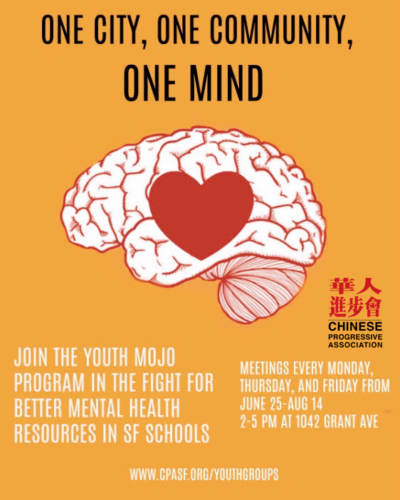 Youth MOJO develops the leadership of Chinese high school youth in San Francisco, with a focus on social issues such as healthcare, education, immigration, and workers’ rights. Youth leaders develop leadership, communication, advocacy and organizing skills. Our program aims to empower youth to make a positive change in their community! Each year, Youth MOJO leaders must attend a 4 day-3 night Youth Leadership Retreat in Lake Tahoe (June 13-June 16, 2018) and MOJO orientation (Fri. May 18, 2018). Gender Sexuality Diversities (GSD) Program was created in 2013 to meet the needs of Asian American youth members for a safe space to explore gender and sexuality issues. GSD supports queer, questioning and ally youth in understanding power, privilege, and oppression more deeply, as well as their own experiences around gender identity and sexual orientation. GSD is open to all youth, and is centered in supporting queer and questioning youth. BREATHE is a space to unpack and explore our mental and emotional health, wellness, and healing. Through sharing personal stories, experiences, and the ways we survive, we will engage with topics such as depression, anxiety, body image, conflict, self-worth and other topics of youth’s choice. Through this gathering space, we aim to build and strengthen coping and resilience skills and strategies. Common Roots is a 7-8 week youth leadership program for working class Chinese and Latino youth in San Francisco. Since 1997, Common Roots has been providing hands-on opportunities for youth to learn about environmental justice as well as cross-cultural and cross-racial awareness. This summer, Common Roots youth will support the growth of 2 community garden projects. Youth Leadership Retreat (YLR) at Lake Tahoe (June 13-June 16,2017) is encouraged for MOJO participants. Common Roots participants are not required to attend. Summer Orientation (mandatory for ALL MOJO participants) is on Fri. May 18, 2018 5-7 pm at CPA’s office (1042 Grant Ave, 4th Fl).